We have extensive, long-running experience with the DDoS threat - dating back to the first noticeable attacks of year 2000. Our state-of-the-art technology keeps abreast with the evolution and proliferation challenges the attackers have to offer. Our team consists of highly qualified professionals, who are keen and able to provide you with the best in modern DDoS attack mitigation. Our watchword: unmatched service excellence. We know how precious your reputation, how vital your financial stability and how essential the contact with your customers is. We also understand how important it is to find an affordable, reliable and resilient protection in today's changing world. Wherever in the world and whatever your business is - we are committed to keep you going. Uptime. All the Time. Guaranteed. We would like to invite those already running a successful online business and looking to complement their portfolio to consider reselling Vistnet's DDoS Protection services. If you're just starting your online business but have a sound business model and are committed to providing only the best to your clients, we'd like to hear from you. applying your own business model by acquiring a pack of dedicated protected IP’s, with IP assignment (your own WHOIS) and practically unlimited time-share and client rotation capabilities. Apart from the standard reseller plans, we can also offer bespoke solutions that are tailored around your clients’ requirements and protection needs. 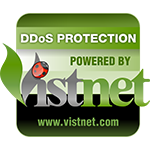 If you are interested in becoming an authorized reseller of Vistnet DDoS Mitigation Service, please fill out our reseller application. For additional information or questions please direct your inquiries to sales@vistnet.com and one of our sales representatives will assist you. Your uninterrupted operation is a valuable asset. Your customers appreciate your efforts to keep it going. Show them you’re protected by placing a Vistnet banner on your site and get 5% off our packages. Please choose your banner and paste the code next to it in the body of your web pages. Alternatively, you’re welcome to apply for our “Scratch My Back” program, where we discount our protection in return for PR action on your part. 1. Include the Vistnet logo as a major element on all printed or electronic materials originating from the Vistnet Headquarters or its field or area offices. Use only the official high-resolution graphics files available on this page. Do not use scanned or low-resolution versions of the logo. 2. Do not change the official colours of the Vistnet logos. Maintain the integrity of the logo without embellishment or change. When reducing or enlarging the logo, make certain to maintain the proportions. Do not rotate or skew the logo. 3. Do not print the logo on top of photographs or artwork so that it cannot be seen. Use the reverse image of the logo if the logo prints on a dark background. Use the grayscale version when printing in black or another single colour. 4. Do not wrap text around the logo. All uses of the Vistnet logo must be reviewed and approved by Vistnet. Please contact us for approval. Should you need any other materials or assistance, please contact us. Please, acquaint yourself with our legal documentation below. For any other considerations or questions, please contact us.